It is no secret that fresh produce can harbor bacteria, fungi, and other microbes along with trace amounts of chemicals. Soil, dirt and dust will cling to fresh produce as well. Fortunately, there are steps you can take to help improve the safety of your fresh fruits and vegetables. The following are recommendations from the University of Colorado Extension. Under running water, rub firm fruits and vegetables briskly with your hands or use a stiff vegetable brush to remove dirt and surface microorganisms. If immersing in water, a clean bowl is a better choice than the sink because the drain area often harbors microorganisms. Always use cool water to wash produce. Do not wash fruits and vegetables with detergent or bleach solutions. Many types of fresh produce are porous and could absorb these chemicals, changing their safety and taste. The Food and Drug Administration does not recommend the use of chemical rinses, which are often sold in the produce section of some supermarkets. In research conducted at the University of Maine, these products were not proven to be any more effective than a plain water rinse. And they are extremely expensive. Adding vinegar to the water (1/2 cup distilled white vinegar per 1 cup water), followed by a clean water rinse, has been shown to reduce bacterial contamination but may affect texture and taste. After washing, blot dry with paper towels or use a salad spinner to remove excess moisture. Start clean. Cleanliness and safe produce go hand in hand. Before preparing fruits and vegetables, always wash your hands well with soap and water. Clean counter tops, cutting boards, and utensils with hot soapy water before peeling or cutting produce. Bacteria from the outside of raw produce can be transferred to the inside when it is being cut or peeled. Buy local. 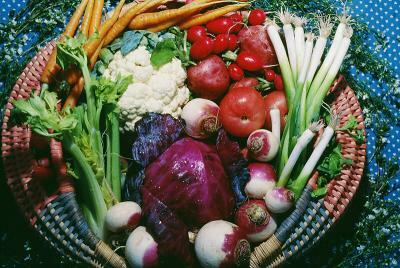 During the growing season, buy locally grown produce. Reducing transport time and distance can help limit the chances of contamination and bacterial growth. At the Farmers Market, produce is not kept cool. It is important to refrigerate, as soon as possible to retain freshness. Supermarket produce. Produce that needs to be refrigerated at the market should also be kept cool at home. Cut melon and salad greens should be kept on cool at the supermarket. Cucumbers and apples are often coated with edible wax to retain moisture. Limit quantities. Most fresh vegetables can only be stored for two to five days, although apples, onions, potatoes, and winter squash can last much longer at appropriate temperatures. Wait to wash. Washing produce before storing may promote bacterial growth and speed up spoilage, so it is often recommended to wait and wash fruits and vegetables just before use. Generally, soil has been removed from fresh produce but if not and you chose to wash before storing, dry thoroughly with clean paper towels before storing. Store safely. Produce that requires refrigeration can be stored in vegetable bins or on shelves above raw meats, poultry, or seafood to prevent cross contamination. Storing fresh produce in cloth produce bags or perforated plastic bags will allow air to circulate. Trim well. Cut tops and the outer portions of celery, lettuce, cabbage, and other leafy vegetables that may be bruised and contain more dirt and pesticide residues. Leafy green vegetables - Separate and individually rinse the leaves of lettuce and other greens, discarding the outer leaves if torn and bruised. Leaves can be difficult to clean so immersing the leaves in a bowl of cold water and swishing for a few minutes helps loosen sand, grit, and dirt. Lift greens out of the water, grit will sink to the bottom. Repeat if necessary. Apples, cucumbers and other firm produce - Wash well or peel to remove waxy preservative. Use a brush dedicated to washing firm produce. Root vegetables - Peel potatoes, carrots, turnips and other root vegetables, or clean them well with a firm scrub brush under lukewarm running water. Melons - The rough, netted surfaces of some types of melon provide an excellent environment for microorganisms that can be transferred to the interior surfaces during cutting. To minimize the risk of cross contamination, use a vegetable brush and wash melons thoroughly under running water before refrigerating, cutting, peeling or slicing. Peaches, plums and other soft fruit - Wash under running water and dry with a paper towel. Grapes, cherries and berries - Store unwashed until ready to use. Separate and discard spoiled or moldy fruit before storing to prevent the spread of spoilage. Wash gently under cool running water just before use. Mushrooms – Place in a colander, spray with cold water, clean with a soft brush or wipe with a wet paper towel to remove dirt. Herbs - Rinse by dipping and swishing in a bowl of cool water and drain in a colander, use clean kitchen towels, a salad spinner, or dry with paper towels. Add fresh vegetables, berries, and melons to your meals. Remember, variety is the spice of life. Eat a variety of brightly colored fruits and vegetables every day. FDA. 2009. Safe Handling of Raw Produce and Fresh-Squeezed Fruit and Vegetable Juices. US Food and Drug Administration. Stolpa, D. 2008. Washing Fruits and Vegetables - Why and How. University of Minnesota Extension. 1A. Zander, Extension Agent, Boulder County; M. Bunning, Extension food safety specialist and assistant professor, department of food science and human nutrition. 3/2010.